Featured that afternoon, among other activities, will be Mr. Marty Jonason, a professional acting coach from Fargo, North Dakota. He is believed to be the last surviving man to have portrayed TR in the original show “Old Four Eyes,” which preceded the Medora Musical. Mr. Jonason also played TR in Medora in 1964. 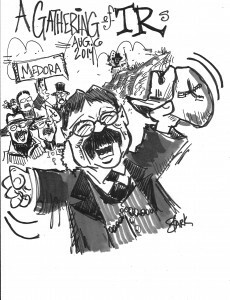 One $10 ticket to a “TR Salute to Medora” will be good for the entire day of performances to be held at the Old Town Hall Theater (OTHT) in downtown Medora. All Events 10:30AM – 5:45PM – Mountain Daylight Time – at OTHT unless otherwise noted. 10:30 AM – Morning Prayer & Thanksgiving for Mrs. Roosevelt’s Birthday (No charge) – Episcopal BCP – Hymn Singing – $10 ticket good all day for all events at OTHT. 11:00 AM – Noon – Theodore & Edith Roosevelt – Portrayed by Larry & Julia Marple – South Charleston, Ohio. 12 Noon – 1:30 PM – Luncheon – Chuck Wagon Patio – Happy Birthday Sheet Cake – Refreshments. 1:30 – 2:15 PM – Program – Marty Jonason – Fargo, North Dakota – “Old Four Eyes” and Panel: Mr. Jonason and Valerie Naylor – Superintendent of Theodore Roosevelt National Park and (tentative) Sharon Kilzer, Program Manager of the Theodore Roosevelt Center at Dickinson State University. 2:15 – 2:30 PM – “A Splendid Little War” – Col. Theodore Roosevelt by William Dietzler – Alexandria, Minnesota. 2:30 – 3:15 PM – TR & North Dakota History in Sketches – Steve Stark – Fargo, North Dakota as TR. 3:30 – 4:30 PM – A TR Salute to Medora – Joe Wiegand – Solana Beach, California – as TR. 4:45 PM – TR in 1911 – Arch Ellwein – Sidney, Montana – as TR. 5:50 – 6:10 PM – The TRs serenade Edith – “Let Me Call You Sweetheart” – Chuck Wagon Patio – Lowering of Flags. 6:20 – 7:00 PM – Edith & the TRs at Pitch Fork Steak Fondue – Tjaden Terrace – scattered seating. 7:15 – 9:30 PM – Edith & the TRs attend Medora Musical – introduced to the audience – serenade Edith – Burning Hills Amphitheater. TR re-enactors have long held conversations about gathering to discuss their craft and share their experiences and insight. Medora and the Theodore Roosevelt Medora Foundation are assisting to make this idea a reality by providing the visiting TR’s with lodging and meals during the gathering. “Part of our vision is that if anyone in the world thinks about Theodore Roosevelt, they will naturally also think of TR’s life in the Badlands. Our efforts in Medora and the efforts of Dickinson State University are helping people appreciate North Dakota’s important role in TR’s life,” says Randy Hatzenbuhler, President of the Theodore Roosevelt Medora Foundation. Wiegand, Medora’s TR, says the coming together of TR re-enactors is just the beginning of a greater movement in his craft. “In the coming years, we will celebrate the centennial of the United States Park Service and observe the centennial of World War One. Edith and her six Teddies will receive a featured introduction at the Medora Musical at 7:30pm MDT. All will be available after the show to take pictures with attendees. Information for TR events and the Medora Musial, on August 6, is available at 1-800-MEDORA-1 or Medora.com.